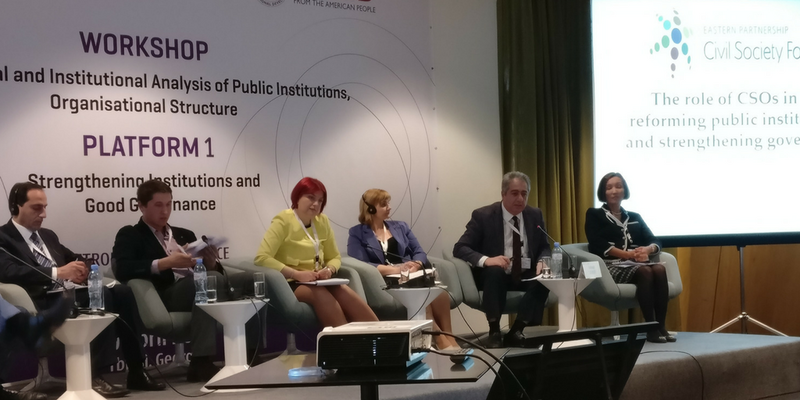 On April 20, 2018, the Eastern Partnership Civil Society Forum participated in the Workshop on Functional and Institutional Analysis of Public Institutions, Organizational Structure, held in Tbilisi under the framework of the Eastern Partnership Panel on Public Administration Reform (PAR). Gubad Ibadoghlu, from EaP CSF member organisation Economic Research Center (Azerbaijan), represented the Forum in the event and shared his expertise on the the role of CSOs in reforming public institutions and strengthening governance. Mr Ibadoghlu focused on core issues of governance, such as the structure and functioning of state institutions; the participation of civil society in public decision making; transparency and accountability; public sector capacity building; and rule of law. He also presented specific policy recommendations for enhancing civil society participation in these reforms at EU, national authorities and civil society level. Implement OECD Guiding Principles for Open and Inclusive Policy Making. Engage in implementation and monitoring of EU Guidelines for Support to Civil Society in enlargement countries at national and regional level.